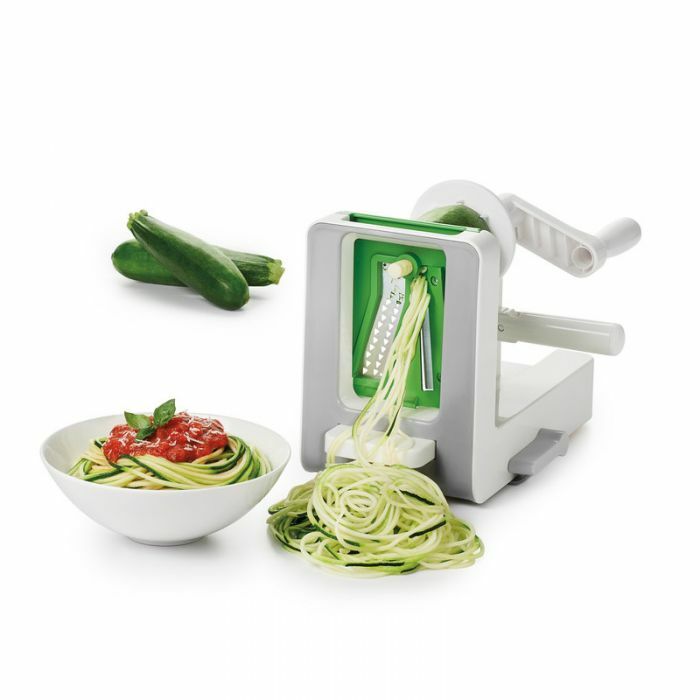 OXO’s Spiralizer is perfect for creating vegetable noodles, a tasty, healthy alternative to pasta. Make quick work of creating uniform spirals from fruits and vegetables for curly fries, salads, garnishes and more. It’s faster and safer than a knife, with a fun and unique end result. Three stainless steel blades create spaghetti cut (1/8th inch), fettuccine cut (1/4th inch), or ribbon cut noodle. Removable blade box keeps blades clean, safe and organized when not in use and stores onboard. Food holder with sharp teeth holds food securely while spiralizing and dishwasher-safe. Rotating handle turns fruits and vegetables to spiralize. Side handle advances fruits and vegetables through blades and folds up for compact storage. Stronghold suction cup for non-slip stability on countertops.